Google’s stock keyboard app for Nexus and Pixel smartphones, Gboard, is my go-to keyboard ever since Swype for Android was discontinued. The popular keyboard app for Android devices recently received the ability to create GIFs but the last update that added a feature I would call “smart” was back in February with the addition of email address autocompletion. Now, it appears that a feature hinted at in teardowns back in January is nearing completion as Gboard tests smart replies to messaging apps like WhatsApp, Facebook Messenger, Google Allo, Snapchat, and more. The feature is currently in development and was discovered by XDA Recognized Developer Quinny899 (Kieron Quinn of Mighty Quinn Apps). Setting up the feature requires first opening up a notification that has a quick reply box then tapping on the suggestion to enable the feature in Gboard’s autocomplete bar. 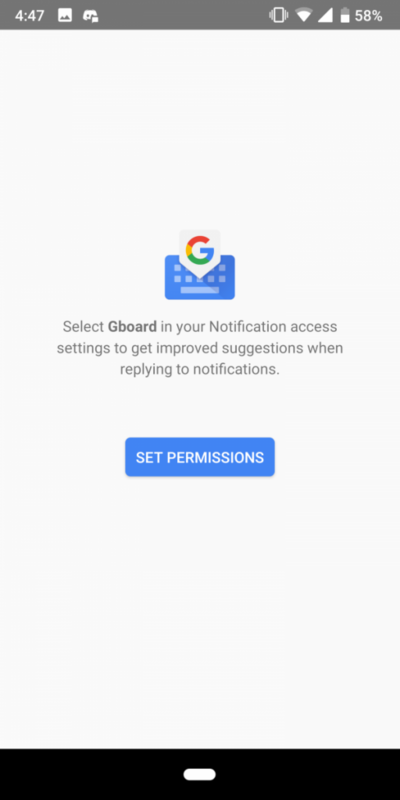 Gboard will then request that you grant it the notification access permission. We tested the feature out with Hangouts, though it works with the other mentioned apps too like Facebook Messenger, WhatsApp, Allo, and Snapchat. 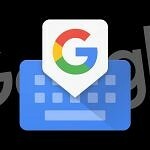 We obtained the list of supported apps by performing a teardown of the latest version of Google’s keyboard app. At this URL, we can see that Google is still tweaking the TensorFlow machine learning model used for smart replies. The latest update to the model was on May 14th, 2018. Personally, I prefer having smart replies in Gboard rather than using the ‘Reply‘ app. 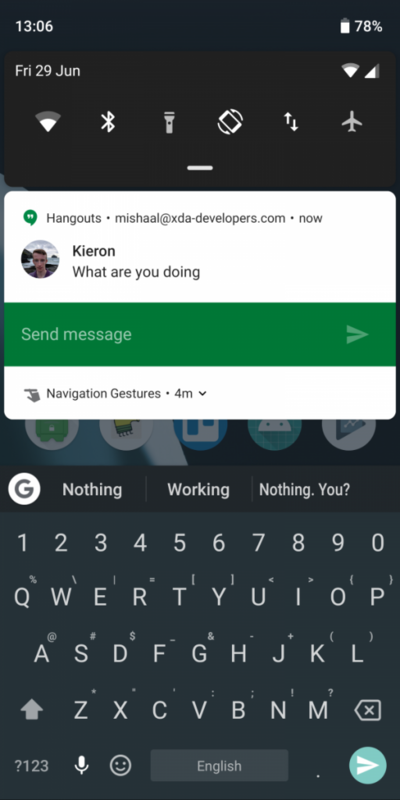 Sure, the Reply app supports more apps, but since it involves replacing the actual notification of the original messaging app there are some annoyances like the fact that dismissing the notification on the desktop client (say Android Messages for Web) won’t clear the notification on Android. On the other hand, the Reply app will work for apps like Facebook Messenger, Allo, Snapchat, or WhatsApp regardless of your keyboard app which is nice. Smart reply features have made their way into a bunch of Google apps and services lately. Non-Project Fi Android Messages users just started getting it and the major desktop Gmail redesign also brings along such functionality. We’ll keep an eye out for when the smart reply feature rolls out on Android, especially if it makes its way over to Chromebooks. In case you’re wondering, the missing back button in the first set of screenshots is from a special ADB command I ran to make the back button invisible. The navigation bar in the second set of screenshots is missing because I had enabled the new OnePlus-style gestures in the XDA Navigation Gestures app. Lastly, the quick settings panel is themed thanks to Substratum supporting rooted Android P devices.